SAN DIEGO, July 12, 2018 /PRNewswire/ -- Today Aquam Corporation ("Aquam"), a global provider of risk mitigation technologies for water and energy transmission, announced that Larry Abatiell, a 30-year veteran in the water infrastructure and engineering fields, joins the company as General Manager for the U.S. Division of Aquam Pipe Diagnostics (APD). Abatiell brings his deep-rooted experience of building and growing complex infrastructure solutions at a time when the company expands its footprint with first-in-kind technology targeted at water and gas risk prevention. As the need to analyze and proactively update aging piping systems grows more pressing each day, decision makers must grapple with how and when to replace this key infrastructure. Being able to assess and prioritize projects leads to tremendous cost and asset savings, in both money and time, for municipalities and utilities involved with managing water and gas pipes before a water or gas line fails. According to the American Water Works Association, needed investments in buried drinking water infrastructure alone will reach over $1 trillion nationwide over the next 25 years to replace the infrastructure that is reaching its end of life. Aquam's technology can save municipalities millions in possible emergency costs, and keep cities and water supply safe from contaminants such as lead. 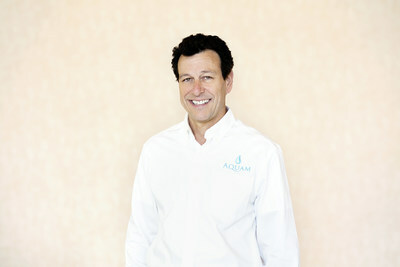 Prior to joining Aquam, Abatiell most recently served as the Executive Vice President of Sales and Marketing for Advanced Infrastructure Technologies, a U.S. based company focusing on composite bridge infrastructure solutions, where he was responsible for revenue growth and product marketing efforts. Prior to that, Abatiell led business development for Hydro International, a worldwide supplier of environmentally sustainable products for the control and treatment of wastewater, storm water, and combined sewer overflows. Abatiell is a licensed professional engineer and has worked with numerous municipalities and local towns in the United States on improving their Stormwater Pollution Prevention Plan (SWPPP), as well as helping them improve their underground infrastructure and bridge replacement and repair. "As our cities age and the U.S. prepares for the impact of climate change, the need for rehabilitated water and gas infrastructure has never been more urgent, this is the critical work that Aquam strives to address through end-to-end service solutions," said Larry Abatiell, General Manager for APD. "Aquam's innovative technology and services are at the forefront of solving some of the most complex infrastructure issues to prevent and mitigate water and gas asset risk management safely, sustainably, and unobtrusively." Aquam's award-winning technology and services predict the likelihood of system leaks, pipe lifespan, decay and failures, swiftly resolving them when failures occur thereby enabling the availability and reliability of transmission and distribution to networks over the long term. Abatiell's role will be to scale APD by providing strategic direction and leadership while improving operational efficiency functions across Aquam's value chain from technology development to customer relations efforts. "Larry is a strong business leader and his addition to Aquam's leadership team brings a wealth of experience in deploying complex infrastructure solutions that are designed to support our growth plan, further establishing Aquam as a global leader in the infrastructure market," said Dan Squiller, CEO of Aquam. "His intimate involvement with municipalities to improve water infrastructure through Water Resource Management and Stormwater Pollution Prevention will be critical to Aquam's work with intelligent infra-city infrastructure. His deep knowledge of infrastructure, specialized technologies, and respect he has earned in the industry are key assets as Aquam continues to grow into new regions in the U.S. and abroad." Aquam Corp is a global provider of technology solutions for water and energy distribution infrastructure. We ensure the health, longevity, safety and reliability of vital resources for water & gas utility, municipal, commercial, residential and industrial markets. Our award-winning proprietary technologies address water scarcity issues by the diagnosis, cleaning and remediation of aging infrastructure. Aquam also provides end-to-end service solutions and technologies for the maintenance, life extension and full rehabilitation of network distribution infrastructure, which include: Nu Flow Technologies, a leader in small-diameter infrastructure rehabilitation technologies; Specialized Pipe Technologies (SPT), a pipe assessment & rehabilitation services provider; Aquam Pipe Diagnostics, a global pipeline assessment specialist. Aquam services are available in North America, South America, Europe, Africa, Australasia and the Middle East. For more information visit www.aquamcorp.com.